Clarification: The state’s report on Cayucos Elementary’s percentage of students on the free or reduced lunch program appears to be incorrect as the report misstates the number of students in the school and the 100 percent is based on that number. The report appears to be correct in relation to other numbers except for the countywide number. It is also questionable as it uses Cayucos’ incorrect percentage to form an overall percentage. Cayucos Elementary Superintendent James J. Brescia said 25.8 percent of his students are on the free or reduced lunch program. School lunches are big business — particularly if Uncle Sam is picking up the tab. And the increasingly imaginative quest by California school officials to qualify for more and more federal dollars is shaping a system that some are calling fraudulent. Wealthy districts are encouraged to compete with poor ones for the dollars available, as district officials seek to maximize the numbers of their needy students. Rigid oversight is virtually non-existent. And it’s not small potatoes. At stake are $1.86 billion in currently budgeted funds in the federal free and reduced meal program, $151.2 million in state dollars — amounting to hundreds of thousands of dollars annually for individual districts. In addition to funds provided for free and reduced meals, many federal, state and private funding programs depend on the percentage of a district’s students approved for free and reduced lunches. These numbers are used to determine which districts receive monies slated to help impoverished students. In California, there are 20 different grants, entitlements or appropriations available to school districts — some of which look at higher percentages of needy students when determining which school with more than 40 percent free lunches should receive limited grant monies. 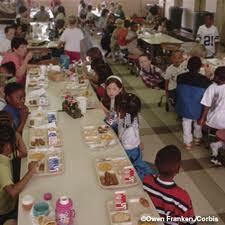 For example, for schools to be eligible for the $25 million that Microsoft provides in technology vouchers each year, at least 40 percent of the attending students must be “eligible to receive free or reduced-priced meals through the National School Lunch Program,” according to the California Department of Education website. And while San Luis Obispo County school officials contend students listed as eligible who are not impoverished do not take advantage of the free lunches, some oceanfront districts such as Cambria are ranked higher on the poverty scale than the community of Paso Robles. Coast Unified School District (CUSD) Superintendent Chris Adams’ reportedly has told some parents in his district that as many as 90 percent of district students qualify for free or reduced lunches. The percentage compiled by the state for CUSD is 54.9 percent. The U.S. Census Bureau reported the average income in Cambria in 2009 at $89,903. Families earning incomes of under $50,000 make up only 10.1 percent of the Cambria population. By contrast, Templeton Unified considers only 13.2 percent of its students to be qualified for the free and reduced lunches, according to the California Department of Education website. When the names of Adams’ two children turned up last week on the district’s free lunch list, it generated questions about the requirements to participate in the program. Adams and his wife, Julie, report a monthly income of $26,000, and would not qualify for such a program. But the only answer sought by the district was the source of the “leak” of the Adams’ signed lunch application. Adams said an explanation of the matter was “simple” but that he could not discuss it because of the district investigation — which he demanded. CSUD Board President Cindy Fratto declined to comment on the matter. But the state’s education chief told his staff last week that he has an interest in investigating the matter, also. Whatever its source, the leaked form has put the spotlight on methodology used to determine the number of impoverished students in any given school district. Districts by law must provide access to free, reduced and full price lunches for all students, but can be reimbursed the cost under the federal and state programs. The National School Lunch Program is a federally funded program overseen by the U.S. Department of Education, and administered in California by its education department’s Nutrition Services Division. The lunch program is open to all children, but only free or reduced in price for those whose income level qualifies them for inclusion in the program. For example, a family of six with household annual earnings of $38,389 would qualify for free meals, snacks and milk. A family of four with an annual income of $40,793 would qualify for reduced price meals and snacks. State data suggests that 41.8 percent of San Luis Obispo County school children qualify for free or reduced lunches — right at the level required to qualify for reimbursement. The higher percentage garners the highest amount of funding. California counties with the highest percentage of claimed eligibility are Merced, 75.7 percent Tulare, 74.8 percent; and Imperial, 72.6. Lowest include Placer, 25 percent; Marin, 26.6 percent; and El Dorado, 31 percent. More than 3.4 million students were eligible for free or reduced price meals at California public schools last year – a nine percent increase from two years earlier, according to state figures. Nearly every county in the state experienced a substantial increase in the number of eligible students during the past three years, according to the Lucile Packard Foundation for Children’s Health. Statewide, 281,696 more public school students became eligible. Nearly 60 percent of all public school students last year qualified, according to the foundation’s statistics. Of those, 84 percent had family incomes at or below $28,665 – 133 percent the federal poverty level for a family of four – making them eligible for free meals. At the center of the free and reduced lunch debate is a federal form for qualification — one page in a large pile of papers distributed to parents at the start of every school year. Federal law requires that school administrators make the form available to all parents. The task of actually filling out the form to apply for free or reduced lunches and other meals is completely voluntary, as it asks for income data and other private information, such as social security numbers. But district officials make concerted efforts to encourage all parents to fill out the lunch form, leaving to those same officials the interpretation of the resulting information, who than send numbers to the California Department of Education with almost no oversight. And some parents allege that this “encouragement” often takes the form of intimidation. State education officials defend the current practices. Youngsters whose parents’ income disqualifies them for free or reduced lunches can still pay for their lunch, and the district receives a stipend per meal. Parents can decline to participate in the lunch program. But Crocker said some parents whose children would qualify for the free or reduced lunch programs don’t fill out the forms “for whatever reason. He complained that “what they (those parents) don’t understand is that the district uses that information for other things, other than free and reduced lunches. “So it’s just easier to just ask everyone to fill them out. That way, over the years districts have been able to get that information from parents, and it does present a way for districts to get additional federal money. I don’t think it’s subterfuge,” Crocker said. I get to follow this story in the Anchorage paper, here in Alaska. “It’s for the kids” “We’re saving the planet” “The poverty, the humanity” “Me, me me, Free, free, free” Look at you, as you wallow in the mire. Lot of work destroying your grandchildren’s future, now isn’t it? Well, the meeting was had…no one was there…no one really cares…and that is good for the district, because no explainations were given as to why the Adams family filled out the form. Dr. Crocker was there, but he got there late, conviently missing the free lunch topic, but being there to bestow the district with accolades in accountability, ironic. It does seem to me that there is a lot of monkeying around with the free lunch monies. It does not just buy food for hungry kids. Our government has it so convoluted that to figure it all out would take time, money and lawyers…so we are better off just letting the same lame system continue. I will say one thing for this CCN site…the school lawyers are reading it and addressing it, or atleast offering excuses for things addressed on this site that were never brought before them in public. More than once last night, they said, “there has been some talk.” Well, the only talking going on is on this web site and they seem to be reading it diligently. So after much explaination last night about how there clerical error occurred, we finally got some insight as to how someone gets verified for free lunch, well kind of…they never really explained how you verify an illegal alien’s social security number. Oh, maybe our 54% ELS students are all legal. Maybe they don’t run the social security numbers, or check marrige certificates, or ask for W-2 forms. The lawyers and the board are acting like they are concerned with the leaking of the oh, so precious social security number being a detriment to the hispanic population filling out their free lunch form, thus down grading our free lunch number to the point where we will not recieve any Title 1 money. So there in incentive to push the free lunch number? I think the hispanic community should know that if they turn in the free lunch application they will be subject to social security number scrutiny. If you were honest and told them that, it would be a detriment. The free lunch program is a joke. Don’t believe me? Go to any grammar school in the county…go to the cafeteria and see how much free food is dumped in the trash by kids getting free lunch. At the Jr. high here, kids get their free lunch, don’t like it and then drink the milk and throw the rest away. It is disgraceful. Do you know how to tell who needs free lunch? I do…kids that need free lunch are hungry. They eat what is ever put infront of them. Kids in Sierra Leon do not throw food in the trash. So lets make that the standard…the free food is simple…everyday it is the same, after all, if you are hungry, you don’t care. A peanut butter sandwhich, crackers an apple and a milk in a paperbag. This doesn’t sound like we need a million dollars to feed the hungry. I mean, that is what we are trying to do isn’t it? Seems to me that if the 25 or 30 people that came to the meeting had shown up in the board room it would have appeared full and been a little more intimidating to the board and Mr. Adams. By changing the venue and putting out 100 chairs (of which only a third were full), it gave the impression no one cared. Well, there are a lot of community members and people who read this who do care and are starting to doubt the party line that we have all been fed for years. hey, great idea…why doesn’t everyone in the county that is suspicious of the free lunch program come to the board meeting up here in Cambria tonight. Mr. Crocker…you live in town. It would be great for you to attend the meeting also, that way you and Mr. Adams can make us all feel comfortable about how well you gentlemen are running the free lunch program. We can end all this hulla-ballo the Athenian way, with public discourse. But I imagine that being a public official will limit what you are allowed to say, because you have said a lot lately, yet have not really answered any questions. The main question is this, “Are you and the county administrators, under your jurisdiction, improperly inflating the free lunch numbers in order to access federal dollars? If the answer is ‘no’, can you assure us that the system in place is is being properly administered and are the checks and balances being utilized? Do you even know? Secondly, you were given a document, leaked by a ‘whisle blower’. Did you do your due diligence to find out the answers, or did you just throw them under the bus in an attempt to keep you fanny covered because you saw the writing on the wall? Is the only reason anyone is even dealing with this is because some how the press got wind of it? Something reallly stinks up here(and probabally in your district too). Everyone should come to the board meeting tonight and watch Adams squirm. I wonder if they’ve already set up the booths selling burning torches and pitch-forks. I almost didn’t see this addition to the story. I’ll bet that many of the posters here didn’t see this as well. Look at the top of the article everyone, it’s there. This is why I said that I don’t trust the accuracy of this story. This is a pretty big mistake. To the editor, how can you say that “the report appears to be correct in relation to other numbers..”, how can you not be suspect of all the numbers? TQ, just an FYI, I had no problem seeing the correction, in bold, at the top of the story. I do agree with you, however, about trusting anything that comes from the accused. Both Adams and Crocker’s stories have been inconsistent and conflicting, and Mrs. Adams role as a consultant for the district has not been explained. I also saw the correction. I’m not concerned about the other numbers. The state report simply missed the fact that Cayucos has 208 students enrolled rather than 51. The State reports for CUSD are correct. The number of students they list in attendance in that district by school tie out to the districts website. Adams has not denied that the reports he filed for his district indicate that 54.9% of the students qualify for the Free Lunch Program. This story isn’t about Cayucos, it’s about the CUSD and if it had been about Cayucos, no doubt Balckburn would have known how many students were actually enrolled and spotted the error when he reviewed the State Report. 54.9% is quite high for the Cambria area, even Cayucos is only 25.8%. I encourage you to re-read this article and ask yourself, is this really the best way to feed our hungry neighbors? From the beginning, the district has prioritized CYA ahead of everything else. When they hired the Munoz law firm, they told them to find the person who “leaked” Adams’ fraudulent forms. Only days (weeks?) later did the school board realize this looked really, really bad, and added the task of finding out if there had been other fraud in the school lunch program. The absolutely most ridiculous part (out of many ridiculous parts) of this story is the fact that Mr. Adams is in charge of the school lunch program! If nothing else, he should immediately be taken off the administration of that program (they can put him on lunch playground monitoring duties) because it is obvious he cannot even provide oversight for his own two kids’ participation in the program. Does anyone know what kind of “consulting” activities Mrs. Adams’ education consulting company does? That should be public information, no? Who provides oversight for Mrs. Adams’ consulting contract and performance issues? OK, I was actually beginning to lose interest as I was reading the article, that is until I got to the part where Janet Jendrejack says “We here at the department think that Superintendent Adams is setting a good example.” Really- WTF? These arrogant brain dead government bureaucrats apparently have absolutely no clue that they are walking, talking poster children for everything that’s wrong with government at every level. All these “intelligent well-educated” administrators and bureaucrats are simply better-trained and more creative at stealing, scamming and manipulating the Kafka-esque governmental systems put in place by the social-experiment elitists, using our tax dollars to play their games and enrich their own salary and benefit packages. So, there’s massive organized scheming, planning and manipulating going on to wrongly acquire tax money? And Crocker and bunch defend their corruption by saying that “everybody does it”, huh? Well, OK, then maybe it’s time for the Attorney General’s office to consider beginning proceedings under the Racketeer Influenced and Corrupt Organizations (RICO) Statute (18 U.S.C. 1961-1968). Oh, and just another brief parting thought- why do the school districts have to find imaginative ways to distort this bureaucratic system to wrongly obtain tax money in the first place? Why do we need another whole governmental bureaucratic procedure to get income figures? The Census Bureau obtains income figures, and the IRS accumulates income information every year. Why not just use their data? Oh, that’s right- that might cause the elimination of Heaven knows how many government “jobs”- sure as hell can’t do THAT! And people wonder why the stores have trouble maintaining their inventories of torches and pitchforks? Great post . I’m not saying anything all I’m saying is …… If the District got rid of Crocker , Adams , and stop using Adams wife . The District could save loooooooooooooots of money . By the way , how much do they use Mrs. Adams and for what ? Isn’t this a conflict of interest ? Hey Honey , should I wear the black or blue tie today ? Oh the blue one goes much better with that suit dear . Thanks Honey , as usual send this bill over to my office …… on second thought send it to Crocker’s office this time . Does Mrs. Adams bill to any budget(s) controlled by Mr. Adams ? … not levity . Dan, have you looked at the whether the funds that the schools/districts receive for the free or reduced fee lunches is actually used for the lunches or is diverted elsewhere? How many “lunches” are paid for and how many are actually used? Just wondering. That is an interesting question and I think it would require an audit to ferret out the actual cost of the lunches they provide. I took a quick stab at that question myself and found that there are some summary P&L’s available on line. The problem is that the summary is rolled up to the extent that it combines their food service cost into the same line as the teachers and administrators expense. Well I’m glad you all have the land to grow your own gardens and orchards!!!! I make a very decent living for how young I am, but in THIS day and age (not back when our parents raised us) things are very different. My parents bought their own house when they got married in their early 20’s making less (inflation in respect) then I do, yet I am no where near able to afford a house for myself and two young daughters. Hence I have to live in an apartment where I have lived in the country on acreage my whole life!! Things have changed. Lets look at the now and not at the has been!! Well, my2cents, we apparently have to explain the “has been” to you so that you can have a better understanding of the “now.” Like others who have shared their experiences here, when I was growing up, my parents both had to work to make ends meet, and yes- we also grew our own vegetables. I even scratched out my own little garden in a tiny little area next to our garbage cans behind the house. When my wife and I got married we had to live in apartments for several years while we saved up for a down payment on a house. We drove crappy old cars, we didn’t have much for clothes, but we worked hard so that we could have a house. After we finally were able to buy our tiny inexpensive starter house, yes- we did grow a garden. And then we had a child- one child.